Please find a list of our most frequently asked questions. Don’t see the answer you’re looking for? Email us your questions at sales@hospitalportal.net. We started the business in 1999. 2. How is your pricing structured? We have set pricing packages depending on the number of FTEs your organization has and whether you are choosing the SaaS or on-premise installation model. Email us at Sales@HospitalPortal.net for more details or get a personalized quote. 3. What are your hosting options? We provide both on-premise solutions and a SaaS/Cloud-Based installation. For our cloud-based customers, we offer 25GB of disk storage, a Tier 3, SOC2, and HIPAA certified US data center. 4. Do you offer a Free Trial? Yes, we offer a FREE 7-day trial. The trial period will allow you to test and sample all of the features, special logins/permissions involved with content editing and policy management privileges. Support and a free trial set up will be provided to you during this time. 5. How do I contact support if I am already a customer? You can visit our HospitalPORTAL Academy for how-to’s, helpful webinars, best practices, quick tips and much more. Or you can contact HospitalPORTAL support desk here or call 866.580.7700 ext 2. 7. What different types of customers do you work with? We work with a range of customers including small rural hospitals, large health systems, long-term care facilities and ASCs. 8. Who manages the content? Your organization will always manage the content, but we do provide content management solutions for organizations that have tight schedules. 9. Who owns the content placed on the application? You own all of the data stored on the system. 10. Are documents stored on the server or in the SQL database? Documents are stored in the SQL database. 11. How many employee logins does the software allow? The software can accommodate an unlimited amount of employee logins. 12. Are there other implementation costs? The on-premise installation is all inclusive, the client just needs to supply the SQL database and IIS server. We offer additional professional services such as onsite training, implementation and Azure configuration. 13. How long is a typical implementation schedule? For a full Intranet, we offer a 12-week implementation process that focuses on setup, branding and content migration. For our Policies and Procedures Only SaaS implementations, we offer a proven 8 step approach. 14. Is training required to use your system? For end users, no training is required. For system and content administrators, we provide various training options. 15. Do you do custom development? Our product is all inclusive, but we offer customization of functionality. 16. Do you have customer support? Yes, we provide US based, in-house support between the hours of 8am-6pm CDT. For any emergencies, we have an on-call staff available for 24/7 support. 17. How are upgrades and enhancements dealt with? For SaaS, these happen periodically and are done automatically. For on-premise installations, clients have an option to receive upgrades four times a year at no additional cost. 18. Can I customize the HospitalPORTAL system? Our Intranet CMS can be customized like any CMS environment. You can use all of the features and components to build pages and design/publish content to your needs. Our Policies and Procedures Management system is a standalone application where only a select group of components can be altered. The HospitalPORTAL system is completely web-based. It is accessed via the Internet and most web-enabled devices with a browser; therefore, all you need is an Internet connection. There is no software to install. 20. Can we access the HospitalPORTAL system on a smartphone, iPad or tablet? Yes, via the web-browser of your choice, you can access the application in a mobile-friendly view or as a desktop version. Note, when using mobile views some administrative functions are not supported. 21. Which browsers do you support? Microsoft Internet Explorer version 8.0 or higher is fully supported. Other browsers such as Firefox, Chrome, and Safari are expected to function but may have some limitations related to the display of content or functionality. If your portal solution includes inline editing for documents, a plugin will need to installed on client workstations. The plugin is compatible with Microsoft Word® 2010+. 22. How will I access HospitalPORTAL? The HospitalPORTAL solutions are designed to support your internal workplace. The system is secure and private; you control who has access. Based on login permissions and viewing rights, the application can be easily accessed through an internet web-browser. 23. Will my data be secure? Yes, for on-premise installations, the security is handled by your firewall security. For SaaS installations, we provide a Tier 3, SOC2, and HIPAA certified data center. Each client’s data is stored in a separate, physical database. 24. Can we cancel the use of the product? For all on-premise solutions, annual support and maintenance services will be renewed automatically annually unless HospitalPORTAL receives written notification canceling the service 60 days prior to the expiration date of the then-current Term. For all SaaS solutions, you can cancel after the first 12 months of service without any penalties or additional fees. 25. 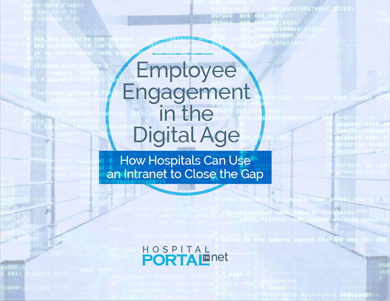 How is HospitalPORTAL Intranet different than Sharepoint? We are all inclusive and much simpler to use. Many clients choose to replace SharePoint with our system. SharePoint takes a great deal of time and special technical expertise. Our system provides out-of-the-box features that are “ready to go” when you purchase the system. Additionally, we have a built-in policy management system that can be purchased with the Intranet or as a standalone system. Our policy management system is a fully featured automated system and not just a document repository like SharePoint. Sharepoint is geared towards developers and tech savvy users, our system is meant to be easy-to-use for non-technical users. 26. How are the documents stored in the system? We support all file types in their native format (Word, Excel, PDF). Furthermore, we provide inline editing support for MS Word documents. 27. How does your system handle document and workflow notifications? The system automatically emails users that have responsibilities as needed. Periodic summaries and on-screen reminders are also available. 28. Is keyword searching an option through this system? Yes, in addition the system will automatically keyword index the document body. 29. Can I manage contracts using the HospitalPORTAL system? Yes, you can use the same document repositories so you can securely store and manage other documents like contracts. 30. Is document read acknowledgement supported in your system? Yes, we have read acknowledgement tools on all policies and a notice of acceptance feature that can attest to staff readership. Additionally, we can do comprehension quizzes or fillable forms to test content awareness and policy comprehension. 31. Is there a way for your system to provide reports on approval history? Yes, for each version of the document, the system stores a detailed audit log of all approvals and collaboration notes. 32. Is there a way to set up different permissions using HospitalPORTAL? Yes, permissions and access levels can be defined separately for document sets, folders or individual documents. 33. Does the system allow specific policies to be searched? Yes, you can search within predefined search collections, document sets or folders. 34. Is there a service level agreement? Yes, for SaaS installations we provide a SLA with your proposal. 35. Do you integrate with Active Directory for Single Sign-On? Yes, the system integrates with Active Directory for on-premise installations. For SaaS installations, Azure integration is available. 36. What are the server/technical requirements to run the application? From end users’ perspective, all you need is a current Internet browser. For on-premise installations, the client needs to provide SQL database and an IIS platform. For cloud installations, all installation requirements are handled by us with no additional hardware cost to the client. For a more detailed guide, please email us for our technical requirements data sheet. 37. Is there a way to link to other 3rd party applications using your system? Our Intranet platform is a digital workplace for your workforce, therefore it allows the creation and storage of a variety of links to 3rd party applications. For all of our content, including policies, a unique URL can be generated to link to that content or document from an external system. 38. Does HospitalPORTAL have any integrated security features? Yes, you can only see documents, pages, and content that you have explicit rights to. Furthermore, detailed document access logs are stored and can be easily reported on. 39. Are there other software products offered by HospitalPORTAL? Yes, we offer a full suite of Intranet applications that are fully integrated into the same platform. For our P&P product, additional features available include forums, ticket tracking, social tools, blogs, online fillable forms, events, FAQs and many other content management features. Please reach us via email at Sales@HospitalPortal.net or via phone at 866-580-7700.